Sometimes referred to as “the stomach bug,” and infamous for spreading through cruise ships, norovirus is responsible for some 19-21 million cases of gastrointestinal illness in the US annually.2 The very young, the very old and the immunocompromised are especially vulnerable to norovirus. It is the most common cause of foodborne illness in the US—responsible for at least 50,000 hospitalizations and between 570 and 800 deaths annually.3 But norovirus respects no borders. It is a global player. Found in both developed and developing countries, it is the main cause of half of all gastroenteritis outbreaks worldwide. A 2016 analysis4 estimated the virus’ global economic burden at $60 billion, the largest share of which ($56 billion) is lost productivity. Norovirus is spread in three main ways: (1) close personal contact with an infected individual; (2) ingesting contaminated food or water; and (3) contact with contaminated surfaces. Norovirus can be transmitted by ingesting food contaminated at the source (e.g., fruits and vegetables) or by infected food handlers. (Food handlers who return to work sooner than 48 hours after they no longer have symptoms can still spread norovirus.5 ) Norovirus has remarkable staying power on environmental surfaces where it can persist for up to two weeks. It can survive freezing and withstand heating to 140 degrees. To destroy norovirus in drinking water, CDC recommends6 bringing water to a rolling boil (212 degrees Fahrenheit) for one minute. 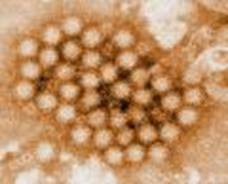 Astonishingly, only 18 norovirus particles are required to infect a human host. For perspective, there are billions of particles in the stool and vomit of infected individuals. In 2012, the Water Quality and Health Council participated in a partnership with public health experts, including the New Jersey Somerset County Department of Health, the CDC, the National Environmental Health Association and others, to develop a series of downloadable posters featuring directions for preparing bleach solutions to destroy noroviruses on surfaces. For example, the posters include detailed directions on how to clean and disinfect an area affected by a vomiting or diarrhea incident. Posters are available in English, Spanish and French and can be found at http://www.disinfect-for-health.org/tools-reduce-spread-norovirus. 2 CDC (2015). Norovirus: U.S. Trends and Outbreaks, http://www.cdc.gov/norovirus/trends-outbreaks.html. 3 CDC (2015). Prevent the Spread of Norovirus, http://www.cdc.gov/features/norovirus/. 4 Bartsch, S.M., Lopman, B.A., Ozawa, S., Hall, A.J., and Lee, B.Y. (2016). Global Economic Burden of Norovirus Gastroenteritis, PLOS ONE, DOI:10.1371/journal.pone.0151219. http://journals.plos.org/plosone/article?id=10.1371/journal.pone.0151219. 5 CDC (2014). Norovirus and Working with Food, http://www.cdc.gov/norovirus/food-handlers/work-with-food.html. 6 CDC (2015). Noroviruses and Drinking Water from Private Wells, http://www.cdc.gov/healthywater/drinking/private/wells/disease/norovirus.html. 7 CDC (205). Making a Norovirus Vaccine a Reality, https://blogs.cdc.gov/publichealthmatters/2015/03/making-a-norovirus-vaccine-a-reality/. 8 “Norovirus Kitchen/Dining Room Response Procedures, City of Albuquerque Environmental Health Department handout at 4th Annual Norovirus Conference, August 4, 2016.